Among our most popular gifts, this particular bonsai covered with abundant red berries is a wonderful choice for the holidays. Called pyracantha, or firethorn, it bears vibrant red fruit in the fall and winter, and fragrant white blossoms in the spring. 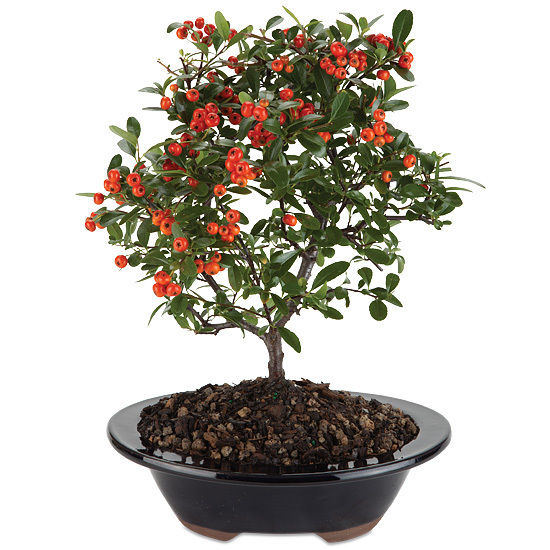 We will ship a three-year-old plant laden with natural and faux berries in an authentic, coordinating bonsai pot. Complete care instructions included. Please note: Berries on bonsai are a combination of natural and faux berries. Place in a location that is well lit, preferably with two or more hours of filtered sunlight. For best results, move the bonsai indoors occasionally – during severely hot or cold weather. Water frequently, but only if the soil feels dry to the touch. To water, place in a pan of water and soak for an hour or two until the soil feels moist.